Til Gud Vadi is famous in India specially made during the Sankrati season. Ladies get together and exchange gifts and give eachother til gud and say " Til Gud gya God God Bola " means have til gud and speak good to eachother. It tastes delicious. 1. In a pan, roast the sesame (til) seeds on a medium heat until light brown. After that keep them aside to cool. 2. Next grind the roasted peanuts into fine powder and keep it aside. 3. Now grind the roasted sesame seeds into coarse powder. 4. In a pan add 2 tsp ghee and add the peanut powder to it. Fry it for 2-3 mins. This is just to enhance the flavor. Remove it in a bowl. 5. Now in the pan add 2 cups sugar along with a little more than half cup water to prepare chasni / sugar syrup. 6. Let the chasni cook until sugar gets dissolved completely and then check for the consistency of chasni. 7. In order to check the consistency, pour 2 drops of it on a plate and let it cool. Place it on your fingers. While separating the two fingers, a thread like should come out of chasni. We need a chasni of solidifying consistency. 8. Now switch off the flame and grease the plates with ghee on which the barfi is to be condensed. 9. Add til/ sesame powder, peanut paste, elaichi powder and grated coconut into the chasni. Mix it well. Keep aside some grated coconut for garnishing. 10. Pour this mixture onto the greased plates and press it well in order to make an even surface. 11. Add the remaining grated coconut over it and allow it to settle for sometime. 12. In around an hour the barfi will get condensed. Now with a knife cut the condensed mixture into square pieces. 13. 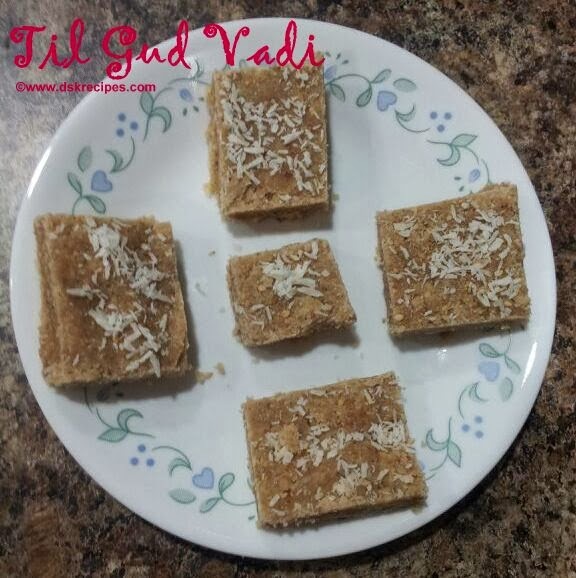 The sesame-peanut barfi is ready ! !